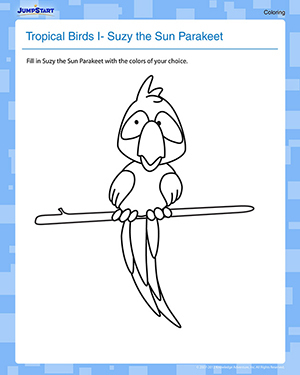 Beautiful Suzy is a sun parakeet with golden-yellow-orange plumage. But she’s feeling a bit off-color today because the sun refused to shine on what should have been a lovely spring day. Can you put the color back in her cheeks? (And the rest of her, of course) Look, she’s already chirruping her thanks!